As told by Triad Speakers, Inc. Director Paul Scarpelli, "In a little more than one year, Muto Communications has increased Triad Speakers visibility within our industry and with the public by at least a factor of four, and without a print ad campaign. New product announcements, press releases, and reviews appeared in all the right A/V publications, greatly enhancing the perception of Triad in the market and boosting sales considerably." In the 2006 inside track Supplier Loyalty Test, Triad Speakers tied for first place overall with Speakercraft in the category of custom installation companies. Industry watchdog publication inside track conducts this annual dealer survey to reveal how dealers feel about their suppliers. 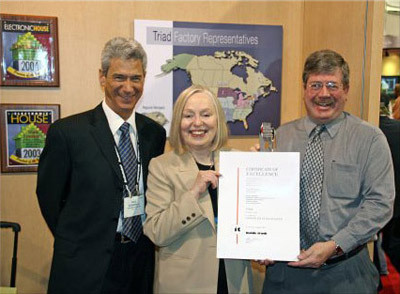 Among the sixteen custom audio video manufacturers, Triad finished high in all fifteen categories, and finished first or second in the categories of Product Reliability, Ease of Doing Business, Technical Support, Product Performance, Product Innovation, Quality of Sales Representatives, Distribution Policies that Support Specialists, and Appropriate Assortment, among others. "The result is a subwoofer with an extremely linear phase response, minimal group delay, exceptional transient response, and virtually no acoustic resonances in the pass band...exceptional performance on music, with outstanding balance, pitch, coherence, and very deep in-room extension..."
"Without question, the Triads are extremely well made and good-sounding speakers. The LCRs disappear into the soundstage like good monitors should and blend well with the detailed and extended Silver PowerSub to form a solid, full-range system. The OnWall Surrounds provided a well-balanced combination of detail and diffusion. The Triad speakers deserve a close listen if you are looking at speakers in this price range or even a bit above."